I have a BHAG (Big Hairy Audacious Goal). It’s to become a well-respected and best-selling author. Currently, I am an unpublished writer (…but I’m getting there). The day I quit my job (December 10, 2014 is burned into my brain) I had written zero books. I’d written many non-fiction book-length things (technology specifications, implementation guides, customer knowledge base tomes, diary entries, training manuals and materials, employee handbooks… you get the picture), but no books. This time last year I finished my first full-length manuscript (SHADOWS OF THE HUNTED HARTS, formerly known as FLIGHT OF THE SHADOWBLOOD FLEET). Woohoo! Immediately upon finishing, I coordinated a chapter reading and Q&A with my old team at NetSuite/TribeHR. I launched www.donnalitt.com. I distributed hard and electronic copies of my manuscript to adults and children for feedback. I worked with an editor to make revisions. I created outlines of Book I and Book II in the series. I began pitching my manuscript. Unless you’ve nailed it, or you’re offering an awesome incentive, it’s a lot to expect of people to read a full-length manuscript (unless they’re family). Most people won’t do it unless you follow up consistently (AKA nag). There are infinite aspiring authors *just like me* which is incredibly daunting, but also inspiring. There’s an Industry Category for people like me: Debut Author. And not everyone in the industry that I want to talk to, wants to talk to me. There are many gates to becoming a traditionally published author, with very few gatekeepers (not because of a lack of gatekeepers, but because there are a crap ton of aspiring authors and publishers are picky). The (all-powerful) gatekeepers (literary agents) don’t like gimmicks or being duped, and they all love quality books in genres they like to read. In other words, Move Fast and Break Things doesn’t exactly resonate in this industry. The publishing world moves at 1/1000th the speed of high-growth tech startups. These stretchy timelines can be used to your advantage, but are insanely frustrating. 100 000 words is too long for a fantasy novel written for eight to ten-year-olds. Quality of writing in all pitch materials (query letter, synopsis, outline, manuscript, go-to-market strategy, etc.) matters. Publishers and agents look for authors who understand their target audience, including: demographics, buying patterns, market size, and market trends. In other words, it’s helpful to know who you’re writing for and who’s going to buy what you create, before you start writing. 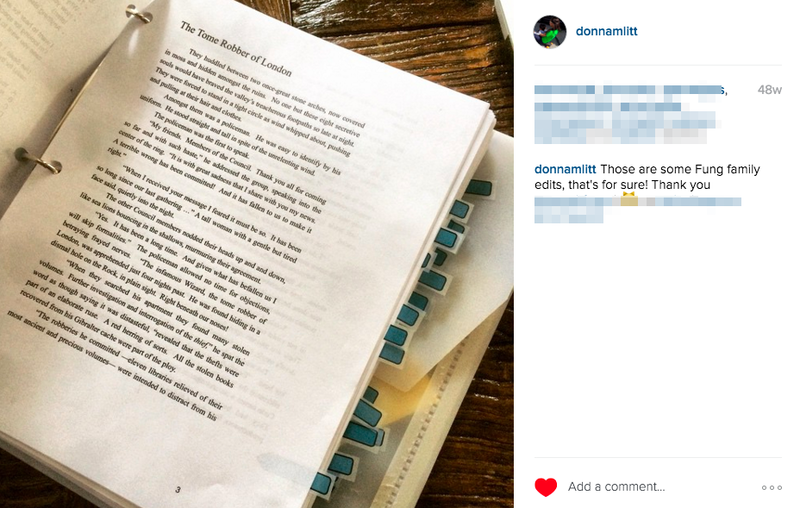 Literary agents refactor and use your pitch to pitch editors. They want to see polished materials (messaging, not visual), so be thoughtful and learn what you need to be market-savvy. Pitching your manuscript to agents before it’s fully baked does not produce positive results. Sad face. There are infinite resources that discuss how to properly engage with agents. Read them, and try not to get frustrated or deterred. Learn the rules, then be strategic and sensitive about how you break them. 20 000 word novella (KINGS AND QUEENS OF PARADISE BEACH) — entered into a contest, did not win. 57 000 word baby-boomer book club fiction novel (WHERE THE SUN SETS) — entered into a 3 Day Novel contest, still waiting to hear back. An experimental 98 000 word YA fiction story about dolphins from the perspective of a dolphin (PEARL) — currently being released on Wattpad. 110 000 word Upmarket Psychological Thriller (SOCIAL GIRL)— fresh out of the oven. All this is to say, I’m someone who learns by Doing (making mistakes).I’ve written manuscripts that could one day be published but aren’t in current form to be; I’ve written and thrown out countless pitches (query letters); I’ve queried immature manuscripts and been rejected; I’ve entered contests and lost; I’ve entered contests that I’m waiting to hear back from; I’ve cultivated an online following; and I’ve pissed off people over the internet by stepping on toes and breaking things (probably something to do with moving too fast). Know where you’re going, and how you intend to get there. Do this by developing an author platform strategy. If you’re not sure where to start, I suggest asking yourself: What do I want to accomplish as an author? Ask yourself this question regularly. Iterate on your strategy accordingly. Set goals that align with your strategy & desired outcomes (ie. number of followers, email list members, words written per day, manuscripts, blog posts per month, etc). Write them down. Track your attainment. READ often. Alternate between thinking about what you’re reading/what you’ve just read, and experiencing the words (a hippie-dippy way of saying “Read the way you normally would.”). Consume a variety of content (books, blogs, movies, music videos, etc.) and think about story-telling across mediums. Everything you do is research. Self-doubt is your only enemy. If you’re unsure what to do, advise yourself as though you’re advising a beloved and respected old friend. Embrace that you’re building a business. Frame yourself up as a business person who is developing a product. Everything else business-y should follow (strategic and research-based Go-to-market strategy, customer personas, know your stakeholders, find your raving fans & early-adopters, etc). Be critical of your business and business model. That doesn’t mean, “Be unduly critical of yourself.” It’s easy to get trapped by this as a one-person shop. Share often and don’t be frightened of engaging in conversations about the world you’ve created and the problems you’re facing. Let go of feelings of inadequacy. Seize all opportunities to talk about your work. Experiment with the language you use to see what keeps people engaged. Use those opportunities to refine your pitch. Physical comfort matters and has longterm implications. If you spend many hours in front of a computer every day, make sure you’re keeping at least one brain cell on wellness. Novels are content. The internet specializes in delivering content to captive markets in interesting and monetized ways. Ask yourself how you intend to leverage the internet and your content-creation capabilities, to reach your goals (and then set new goals). When you sit down to write anything new, identify the purpose behind what you’re writing and think about how it fits into your author strategy before getting too far along. Decide what you’re hoping to accomplish with that piece of content. Record it, and then immediately start writing. Whether you know your characters inside out or not, at the very least know their strengths and weaknesses. And then challenge them. Put them in scenarios where they need to use their existing strengths or develop new ones, to overcome their weaknesses. Never stop asking yourself: Why did Character X just do that? What would Character X do next given the circumstances? What wouldn’t Character X do? What would make this situation better/the best/worse/the worst, for Character X? Ask yourself: What is Character X doing at this exact moment? The combination of who that character is and what setting they’re in, will help you determine their motivations at a specific point in time. Once you’re done Version One of your manuscript, revisit and read through your vision (research and planning notes) for that manuscript. Reflect. Do whatever you can to minimize the amount of time that lapses between completing Version One, and comparing it to your vision. Never stop asking yourself: Does every next word, section, paragraph, chapter… move the reader forward how it should? Write only what needs to be written at any given moment in time. If the reader doesn’t need to know something, don’t include it. Provide details and backstory when that content has the power to move your story forward. Ask yourself: What is the moment everything changes? Because that is where your story should begin. Think about what is going on at that moment (What is happening in the world? What are your characters doing? What is their emotional/physical context?). Read other books in the genre you’re writing in, and then think about them. Analyze them in interesting ways. Because I’m discovering the industry and what works/what doesn’t, I aggregated findings from four different novels to give me goalposts for my own story (number of characters, number of perspective switches, percentage of novel dedicated to primary & secondary characters, story arc, etc). Your characters are people. All people have secrets. Your characters should have secrets, too. Experiment with how to reveal, or not reveal, a variety of secrets. Formalize a forum for feedback (writing group, LinkedIn group, book club, sky’s the limit) and set ground rules. It helps to be creative so that you’re keeping people entertained and engaged, and not inadvertently stretching them. 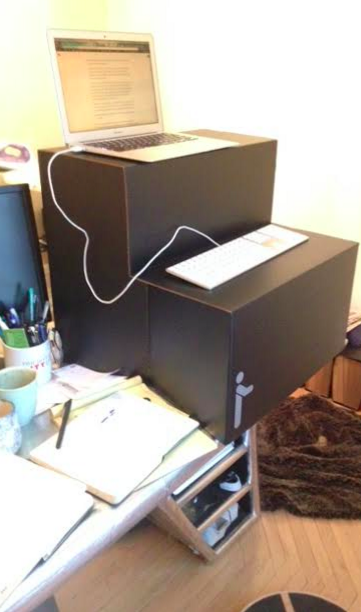 Standing desks are your friend. If you don’t have one, I suggest looking into one of these affordable Oristand alternatives (see below). Yoga ball chairs are your friend. Balance boards are your friend. Keeping your body engaged is a great way to keep your mind focused. Reading your book as an ePub on an eReader is a top notch way to get lost in what you’ve written (for late stage editing purposes). Literary agents love Twitter and hashtags (#PitMad, #MSWL, #AskAgent, the list is literally endless). Research them, and use them properly. Countless words have been written on the topic of becoming an author — unfortunately, I need to make my own mistakes before my brain opens its doors to learning from the mistakes of others. That means my recommended reading list is small: Wonderbook by Jeff Vandermeer, Carly Watters Blog, Jenny Bent Blog. But I do have one big suggestion: Get out there and Do! Thank you for reading :) Please don’t hesitate to reach out if you have questions or would like clarification .